By this time last year I'd already found an xmas collection at Kmart, so it never surprises me when stuff shows up there ahead of other stores. 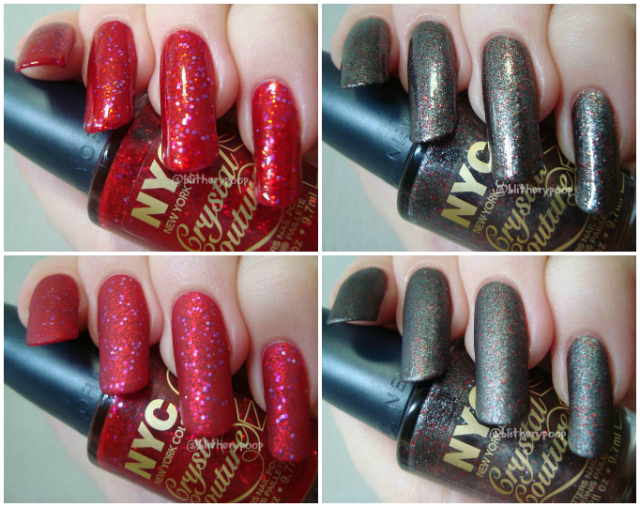 I think G. of Nouveau Cheap is right in speculating that NYC's new Fashion Queen collection will turn up at Rite Aid (and maybe CVS) soon, but I've only seen it at Kmart. 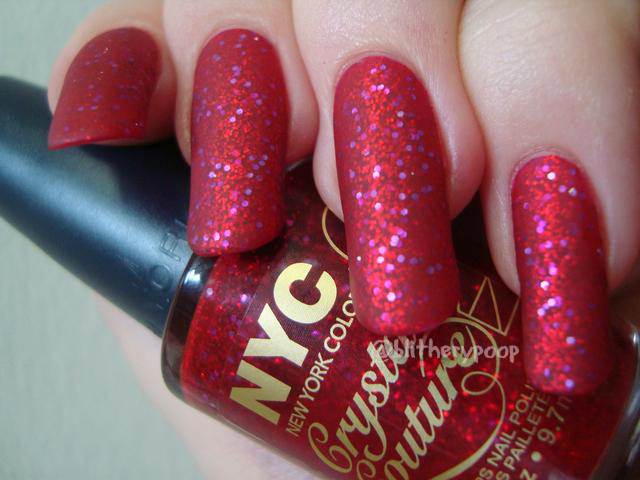 This collection has a mix of five Crystal Couture full-coverage glitters and three "regular" polishes. Of the eight shades, I bought the two most dynamic glitters and...something else you'll see at the end. 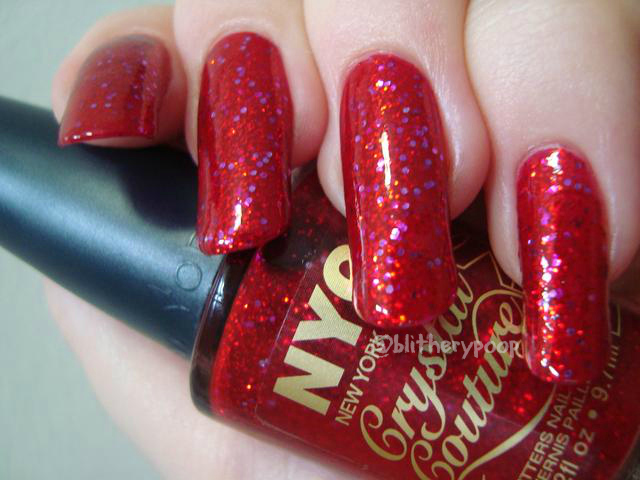 Ruby Queen has small red and medium lilac hexagonal glitter in a red jelly base. They didn't skimp on the glitter, did they? This is two coats, which was such a relief. As much as I love bargain brands, they're known to be stingy when it comes to glitter. 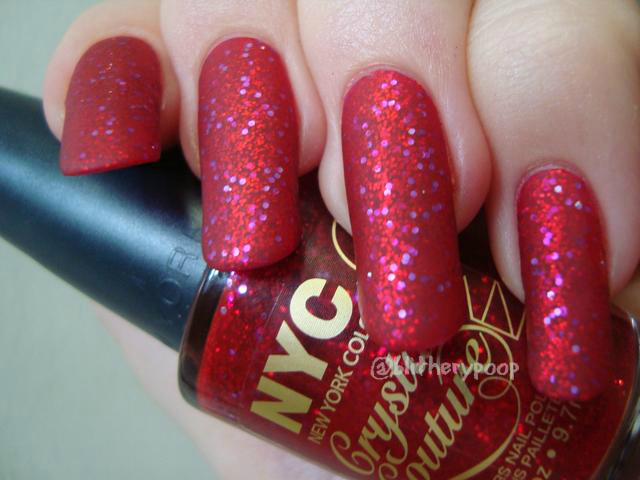 Polishes like the ones in Sinful Colors' Almost Famous collection usually wind up needing undies. I'm really happy to say that's not the case here! The sparkle is intense! The lilac glitter keeps the whole thing from being too xmasy, but it's still super twinkly. I like it more with matte top coat. The matte look really brings out the depth of the jelly, doesn't it? 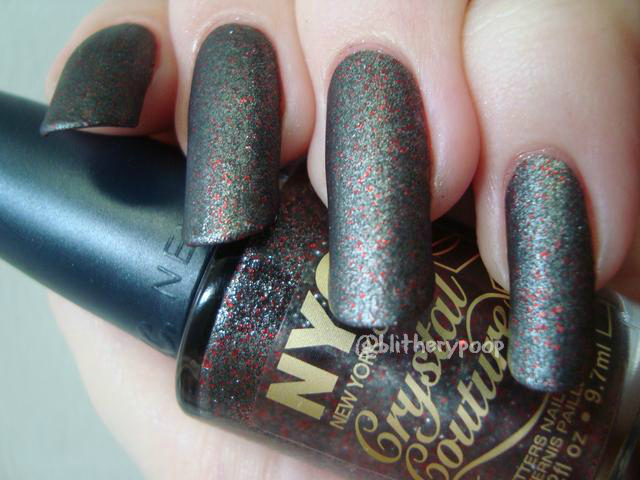 Rule The City has small red glitter in a gunmetal gray foil base. Aaaah!! LOVE!! It's like the lovechild of Sally Hansen Shoot The Moon and Sinful Colors Black Magic...but maybe even more awesome. This is two coats. I love it just as much matte! 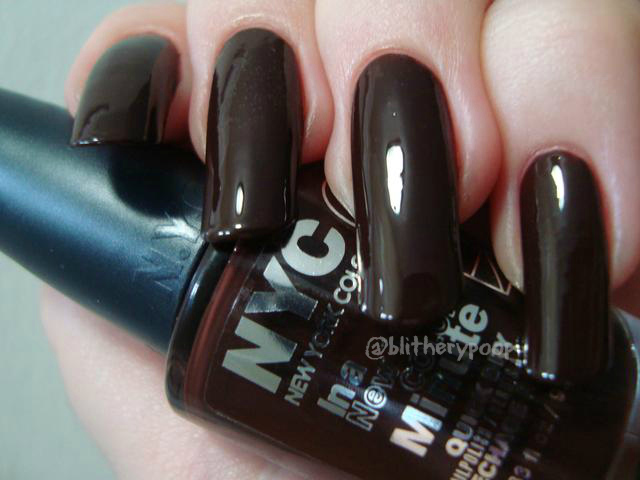 Royal Chic is a dark brown crelly. Here's that "something else" I mentioned. Royal Chic is beautiful, but I obviously had trouble with it. Out of the bottle it was thick and bubbled like crazy. I thinned it for the second coat on my ring and pinkie, it was that iffy as-is. You can see it at its worst on my middle, but also see how much of a difference thinning made. It should be wearable now and it is a really lovely brown. 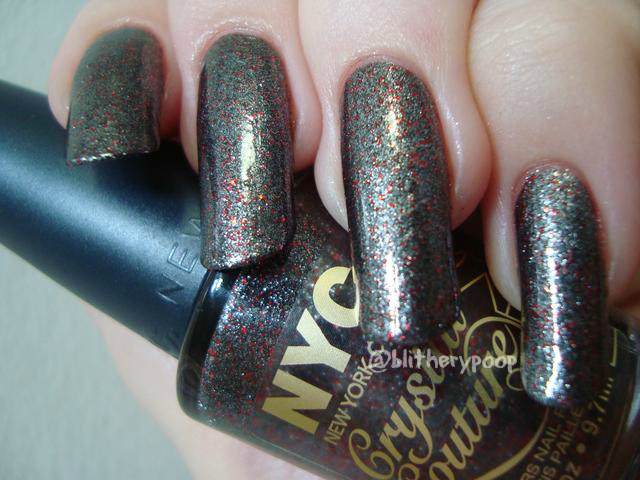 Bottom line: Ruby Queen and Rule The City are both awesome! 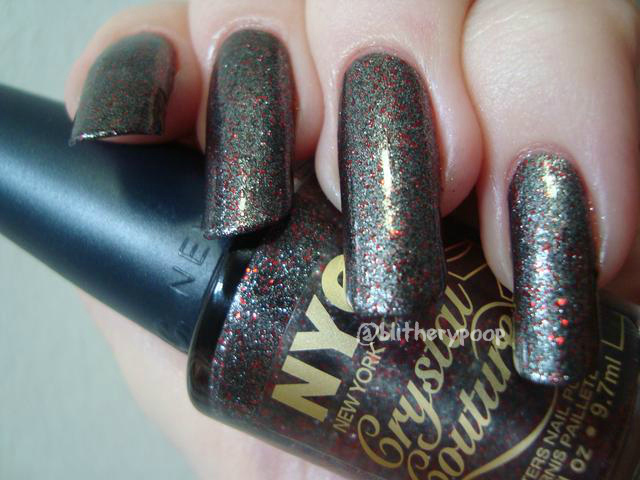 The rest of the Crystal Couture glitters are simpler, but from the bottles they look like they're also full-coverage and not toppers. Royal Chic needed thinning, but is very...well...chic, once you get it under control. How perfect will Rule The City be for Halloween? I am so ready! 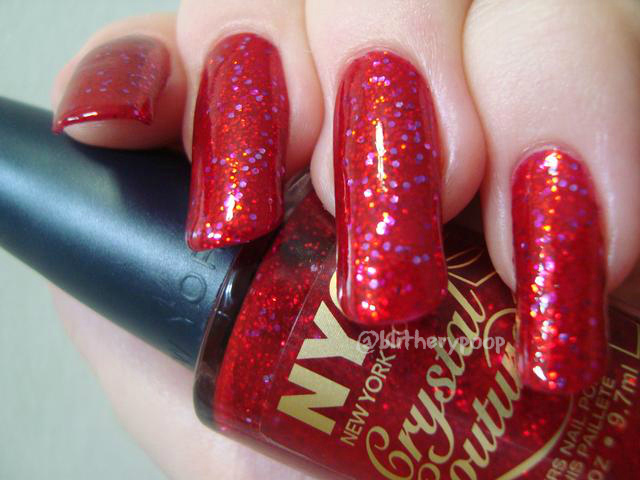 I want every single polish in this collection, which may be be difficult to get sinceI'm abroad. Regardless, beautiful.